Usually, I make my own cleaners or simply use Ecover dish soap on everything. I figure if it is safe for my dishes, it is safe for everything else. One place I struggle though is the bath tub/shower. I have tried every homemade concoction under the sun from vinegar to cream of tartar, but those stubborn mineral stains remain. I have finally found the solutions: Seventh Generation Natural Tub and Tile Cleaner. My spring water comes from the roots of an old oak tree and is gravity fed to my home. This may sound idyllic, until you see the mineral stains it leaves on the shower and tub walls. I scrub and scrub until I get tendonnitis, but those stubborn stains return in about a week. Like my toilet, I like to keep my bathtub clean for my little ones. Seventh Generation Natural Tub and Tile Cleaner has simplified this tedious job. I simply spray it on, let it sit for about three minutes, then gently scrub the stains away with a walnut scrubber sponge. No more crazy scrubbing until my arms ache, and since it is made by Seventh Generation, I am not worried about my children being exposed to this cleaning product. Aqua (water), polyglucose, coceth-4 and deceth-5 (plant-derived cleaning agents), lactic acid (soap scum and lime scale remover), sodium hydroxide (pH adjuster), essential oils and botanical extracts* (citrus aurantifolia (lime), abies balsamea (balsam fir), calilistris columellaris (cypress)). *D-limonene is a naturally occurring component of these ingredients. This product is non-toxic and biodegradable, has no harsh fumes or glycol ethers, is not tested on animals, and is Kosher-certified. 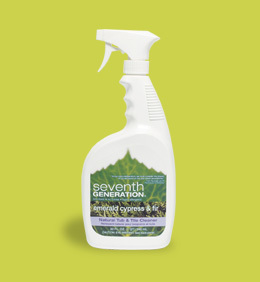 Seventh generation is green cleaning at its best! Even though I make most of my cleaning products, there are few Seventh Generation products I could not clean without! Sounds good! I’ve always had great sucess with using vinegar on hard water stains – it may take a little longer, but it works great! I’m going to look for this product as we are in mid move and everything needs cleaning! BTW-I’ve just learned that the SPCA will take half used cleaning products that you no longer want in your home. I’m sure I’m not the only newish mom who has a box full of half used too-harsh cleaners that I don’t know what to do with. I might give this a shot. I’ve been using the Method bathroom cleaner up until this point — I love the eucalyptus scent. If you’ve ever tried the Method, do you know which cleans better? I’ve tried the Method shower spray, and I am not impressed. I have also read some things recently about the company (sorry I can’t remember specifics), but I fully trust 7th Gen. Toxic Toys: What is that New Plastic Barbie Smell?